Please complete this questionnaire explaining your interest in serving with the Preserve WV AmeriCorps program. BEFORE completing this questionnaire, please email info@pawv.org for site and service descriptions if you have not already received them. As part of the application process, you are required to complete this form and the application at https://my.americorps.gov/, in addition to sending a cover letter to info@pawv.org. If selected to move forward in the application process, program staff will set up a phone interview. The final step in the application process is an interview with site supervisors. * 3. Select the open, one-year, full-time AmeriCorps service opportunities for which you would like to be considered. Before completing this questionnaire, please email info@pawv.org for site and service descriptions if you have not already received them. * 4. Select the open, short-term full-time / accelerated part-time AmeriCorps service opportunities for which you would like to be considered. Before completing this questionnaire, please email info@pawv.org for site and service descriptions if you have not already received them. * 5. 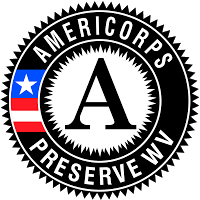 Did you complete the My.AmeriCorps.Gov application and submit it under the Preserve WV listing? * 6. To be a member of the Preserve WV AmeriCorps program, you need to be able to commit to a specific term of service. Accelerated part-time members must complete 900 hours of service between their start date and December 31, 2019. Are you able to make this commitment, or do you foresee any reason you would not be able to complete a full service term? * 7. The minimum requirements for serving in the Preserve WV AmeriCorps program are: Demonstrable historical research abilities; Good written and verbal communication skills, including public speaking; Good organizational skills, required to work on multiple tasks for event coordination and volunteer management purposes; Comfortable working with different types of people; Responsible and able to be self-directed and take the initiative; Experience with historical resources, public history, or historic preservation (or ability to prove capability to learn); Familiarity with heritage tourism (or ability to prove capability to learn); Some leadership experience or group/staff/volunteer management experience (or ability to demonstrate effective leadership skills); Computer experience: internet research, Microsoft Suite (including PowerPoint, Excel, and optimally Publisher), email, social media/blog (graphic design skills not necessary but appreciated). Must be willing to travel statewide for some positions and for training opportunities. College degree or significant life experience preferred; some college education required. Are you able to meet the minimum requirements for this program and perform the functions (with or without reasonable accommodations)? * 8. What is the highest level of education you have completed? * 9. What are your career goals? * 10. How do you think this service opportunity will help you to obtain these goals? * 11. Do you have a car? Having your own transportation is crucial in most of West Virginia. * 12. In which type(s) of WV area would you prefer to work/live? * 13. Have you ever lived or worked in a rural area or small town? On a scale of 1 to 5, 1 being the least and 5 being the most, please rate your experience level for the following skills. In the boxes below, explain why you gave yourself that rating.